This review was going to be one of my shortest ever until I started typing this paragraph to draw your attention to how short it really is. Then I started looking at the photo to your left and wondering if Dogfish and Flying Fish get along. "You can think about THAT until Saturday night. Oh, the Thinks You Can Think!" 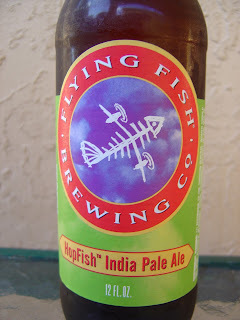 Today I'm drinking HopFish India Pale Ale brewed by Flying Fish Brewing Company in Cherry Hill, New Jersey. Very simple label. Bread and fruit, not exactly citrus though, and a little spicy aroma. 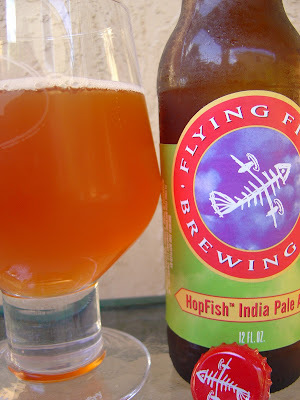 Peppery flavors start thing off, but a fruity blend backs into that and balances it out. More bread and sweet orange flavors further even out any hoppy presence. The 6.7% alcohol provides a drying finish. Smooth. Actually could have used a bit more carbonation. Simple yet flavorful. Easy drinker, not bad.